There has been quite a frenzy of discussion about the new Cricut Explore machine. The initial launch of the machine on HSN sold out. It is very interesting to read all of the opinions that are floating around but there is a lot of bad information so be sure to consider the source of anything you read. I had a little "inside information" since my friends Joy and Melanie were invited to the Blogger event in Utah. One of the main questions I had for them was "does this new machine cut perfect circles and scallops?" When they assured me that it did, I became much more interested in buying the machine. I got my first Cricut machine in 2007, a week or two before Thanksgiving. I don't remember exactly how I first heard about the machine, I just remember looking up the Cricut website and watching some videos. It seemed like a wonderful tool to have and I bought a machine bundled with four cartridges from ACMoore. Shortly after I bought the machine, the Design Studio software was released. I bought a copy for my Christmas present but didn't actually open it and start using it until later in January. These swirls from Accent Essentials were the first thing I welded together. 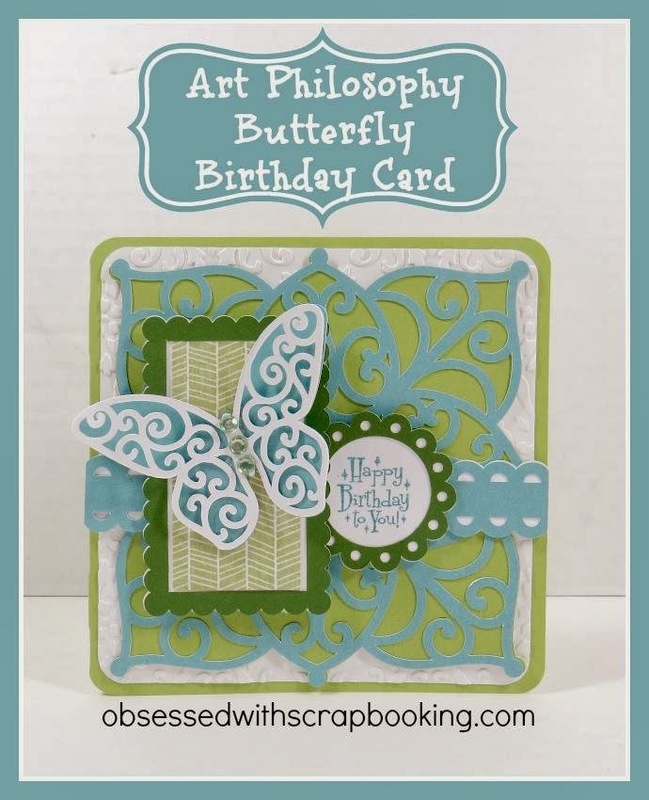 Next, I added some butterflies to the word "Butterfly" in the Teardrop font and I was hooked. Along with a few other message board members and fellow Design Studio enthusiasts I couldn't stop creating designs. The shapes from the cartridges could be combined in so many ways to make new images. I made a lot of full page mesh designs. I also started welding images inside of frames - and learned all about "burping" the images (if you don't remember that, don't worry - you don't have to do it anymore!). 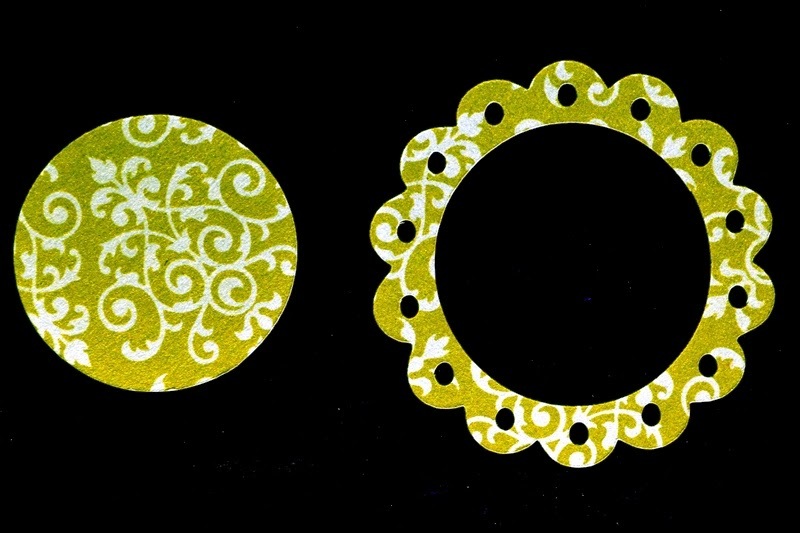 At that time, scalloped circles were very popular for adding a sentiment to a card or for stamping and coloring an image. 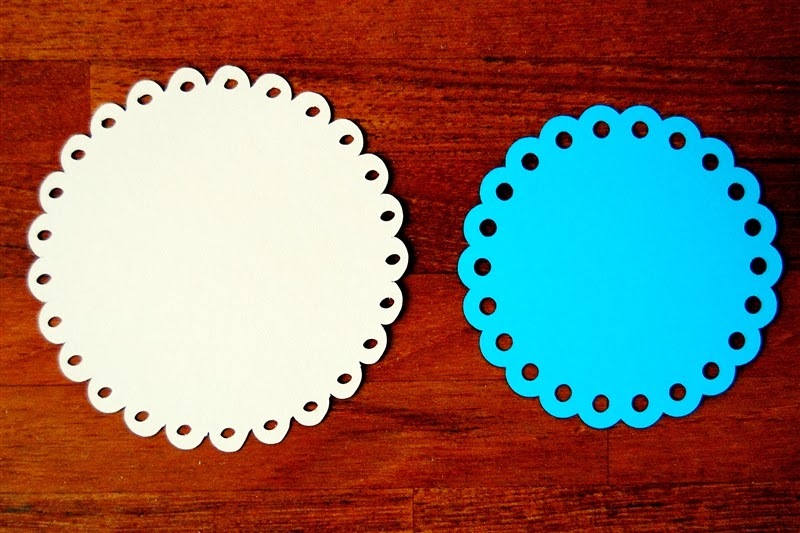 I cut scalloped circle after scalloped circle from several cartridges but they never looked right. 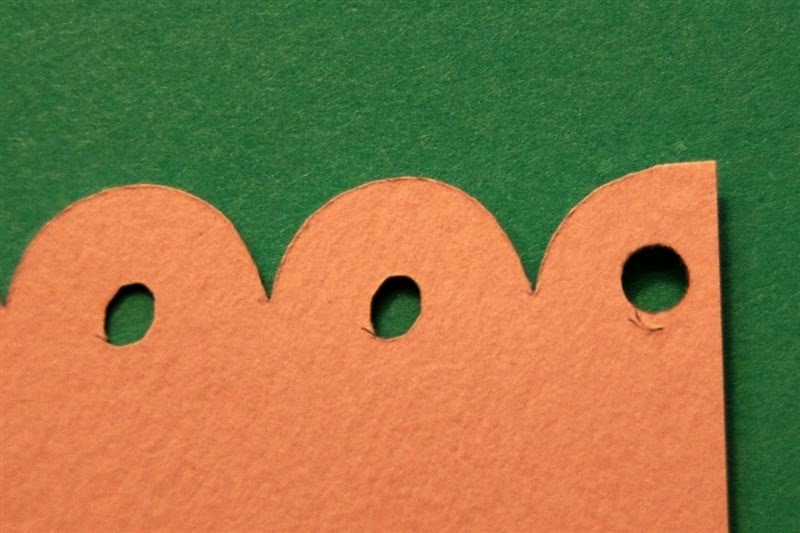 I designed mathematically accurate scalloped circles and they still cut "wonky." There was always a slant at some point going around the circle and the bumps were uneven. 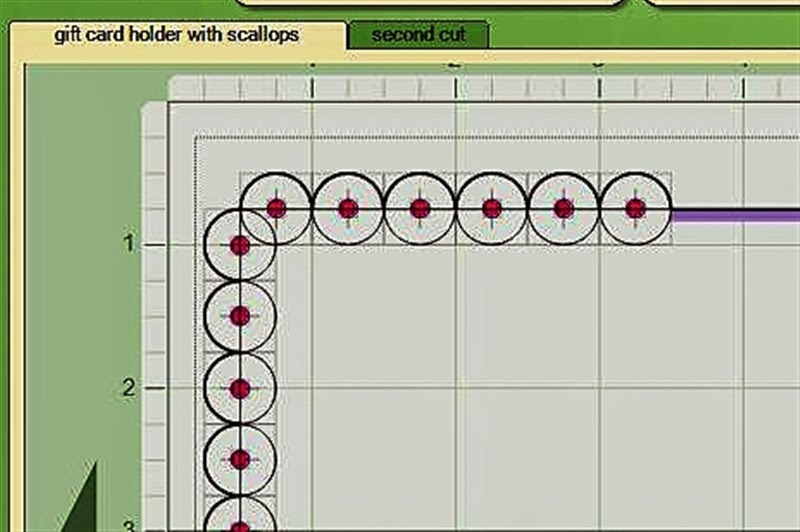 I decided to create my own scallops using the Design Studio program. I could make perfect scallops with perfect tiny circles inside each bump but they never would cut the way they looked in the software preview. The bumps slanted and the tiny circles were more like ovals. This photo mat design looked perfect on the screen but the scallops and circle cuts were very poor when I actually had the machine cut the design. I even designed some scallops with 1/8 inch holes and then compared the result with punched 1/8 inch hole - the Cricut cut circles are not even close to round. There were plenty of other things that I liked to cut out so even though the wonky scallops and circles were a problem for me, I kept working with the Cricut. There were not many other choices for machines and they all seemed very complicated to operate. I continued to buy cartridges and enjoyed a lot of things about the Cricut but the scallops and circles still "bugged" me. I started hearing about other machines and began to pay more attention to what I heard. Skipping ahead a few years - in 2011 I started hearing more and more about the Silhouette SD and the ability to print and cut designs. I ordered one to use to make wedding items for our older son. 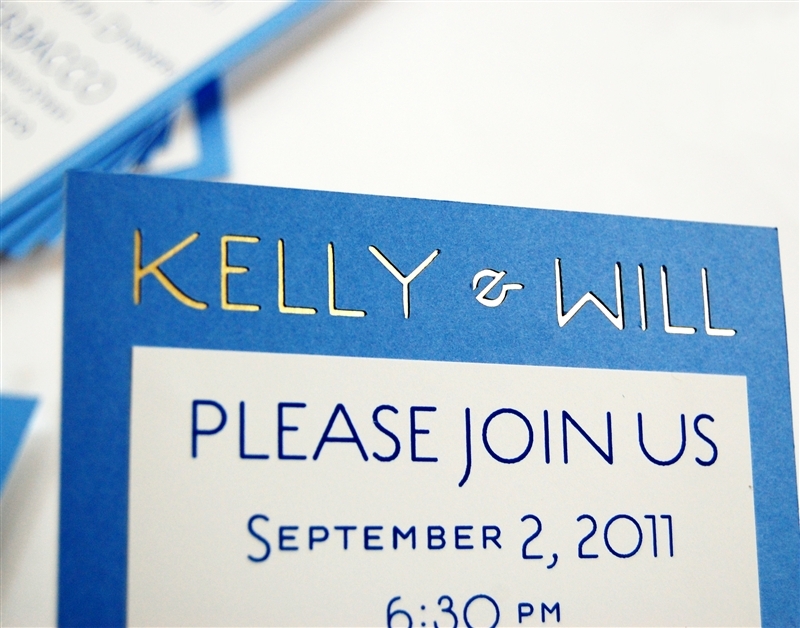 Kelly and Will had chosen a certain font for their wedding items and this was the only way I could cut out their font and also do print and cut projects with the font. In May of 2011, I received the E2 machine that was part of the Cricut Cruise package. I was very excited to try it since it was supposed to cut better than any previous Cricut machine. 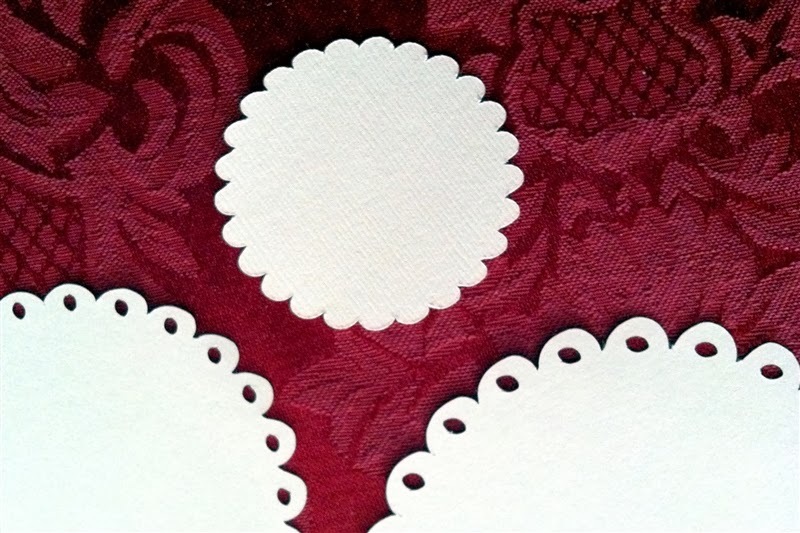 One of the very first things I tried cutting were some scalloped circles, with and without the tiny circles in each bump. They were such a disappointment! Here is the comparison of the cuts I got from the E2 on the left and the SD on the right. Both of these were cut using a design that was native to each system. I don't know how many other people have a problem with these cuts on the E2. I was surprised to discover recently that the exact same image from the Craftroom cut very differently on the E2 and my trusty old Expression. I have always had pretty good luck with intricate cuts on the Cricut Expression. 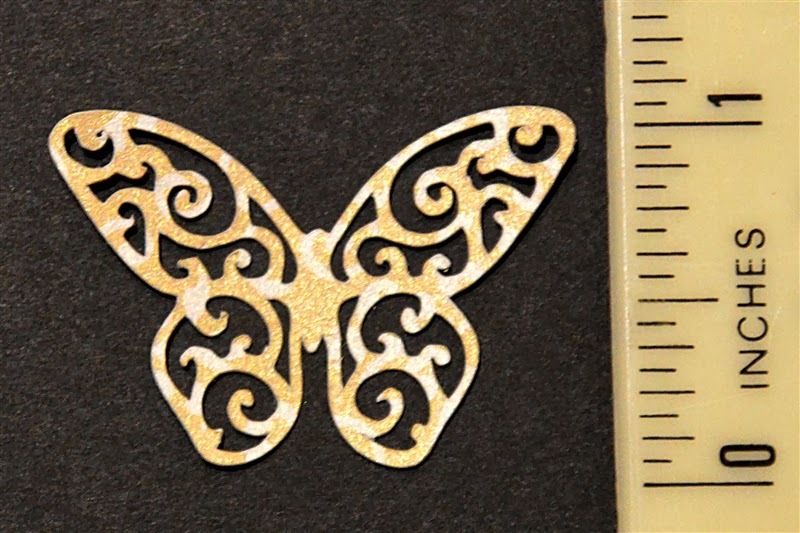 This is the butterfly image that I cut at one inch - ridiculously tiny and it still cut the details. However, the leaning scallops and oval circles still persist with all of my Cricut machines. Look at that little scalloped circle with small holes - it is close to perfect! And look at the scalloped rectangle - also perfect looking scallops. 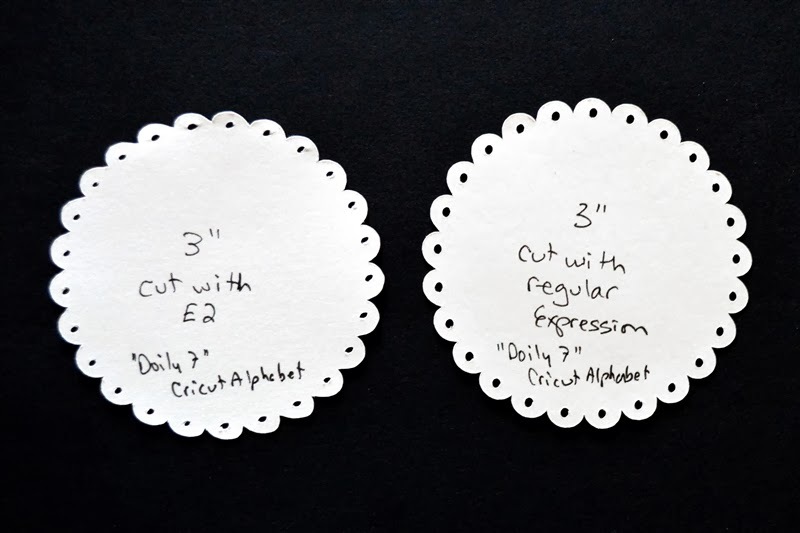 Back in November of 2012, I wrote a post with some thoughts about choosing a die cut machine - basically comparing the Cricut machines with the Silhouette machines. You can find that post HERE. There are a lot of things to consider, some of them depend on your personal preferences for crafting. 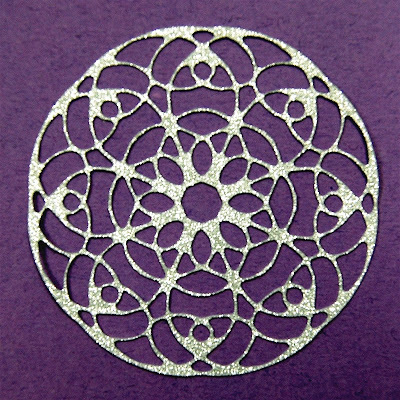 If you want to draw your own designs like this lace cut I created with my Cameo, you will need to do that with another software program. But you may be able to cut it now with the Explore - and combine your original images with the Cricut images - so many possibilities! If you are as obsessed with symmetry as I am - the Cricut Explore finally seems to have conquered the "wonky circle" problem. There is a long list of other things I considered before deciding to make the purchase - those will have to wait for another post. But I am finally going to be able to cut images from the hundreds of cartridges I own and have them cut true to the shape as it appears in the handbook. The Cricut Explore is controlled by a computer with an internet connection. You can not use it by just plugging in a cartridge. Everything is done through the Design Space online. If you want to see the Design Space in action, there are some new videos on the Official Cricut You Tube channel HERE. Joy has also posted some great videos on her You Tube channel HERE. About those boxes - I couldn't take a photo of what I plan to add for today. I should be receiving the Explore machine I ordered next week and you can bet the first thing I'll be cutting is some scalloped shapes. Each of the boxes will get an assortment of scalloped shapes for you to see how well the scallops cut and to use in making your projects. How do you play along in the blog celebration giveaway? To enter for a chance to win one of the three boxes - see all of the details on the first blog celebration post HERE. Then come back and get your comments in on this post. Remember, if you sign up for the new newsletter (see the box at the top right of the page) I will be choosing one person from the subscribers as a box winner (you don't need to leave a comment here since I can see that list). Are you obsessed with anything the way I am obsessed with symmetry and scallops that are true in shape? What is your crafting pet peeve? Let me know if you think I am crazy to care so much about getting the right shapes! I really enjoy reading all of your comments - I wish I could send everyone a box. There are still some more great things coming - these boxes are going to be really full! You are not crazy!! I get obsessed with the mats showing the same amount on each side when double and triple layering!! So, sometimes I feel crazy!!! No I don't think you are crazy. I get obsessed when crafting. If I can't find something I keep looking no matter hiw long it takes. We all have some type of obsession. Thank you for all the pics. Wow what a difference. When I make a card, if I'm not pleased with it, it doesn't get sent and I go back to the drawing board to redue some of the details that I wasn't satisfied with. No I can't think of an obsession when it comes to crafting, except maybe messy glue. I guess I don't cut too many circles with the cricut so it hasn't bugged me. Still looking forward to your review of the explore. But of course you are crazy...we all are! No, seriously I think you are an Artist! And you want your projects to look like you envision in your head. I get crazy trying to get things taped down straight. I have issues with that...I am always looking for some good way to get things on the card straight. Circles and scallops dont' bother me much...I'm too busy trying to get them on the card correctly. Thanks for the info on the new Explorer....I'm reading everthing before I decide to purchase. Still on the fence. I so enjoy your attention to detail. I just get frustrated I don't have time to work on projects. When I have time to create I just enjoy! I think as much money as we have all invested in our Cricut and other crafting stuff, it should work as expected. So no, it's not obsessive. I guess what I obsess about most is, am I wasting the blade or mat, by not having settings just right. For me, I think the best and most I intricate cuts I get come with using vinyl. I like to shadow my welded words and I get obsessed trying to make them perfect. They usually look good on the mats and when I cut them they ever seem to match perfectly. Well, friend, if YOU are crazy/obsessed about your circle shapes and scallops, then I am in the same boat. Can we share a padded cell, preferably one stocked with paper and toys? My crafting pet peeve is being given a list of supplies for a project and then getting into it -- and finding that the list is incomplete. GRRR. Oh, one more: I detest being interrupted when I am deep into my "mojo". That includes family needs (e.g., dinner), personal needs (e.g., bathroom) or other (e.g., sales telephone call). If your crazy Diane your in good company! It really bothers me when so much time and effort is put into creating a card but ribbon is not tucked under so you see fraying or my biggest pet peeve is using brads without a backing so when you open the card to read the sentiment inside you see the split prongs. Crazy maybe. Not crazy at all! It is so frustrating when a cut doesn't turn out as expected, especially if you are wasting a lot of time and paper to have to recut! I agree, there is an expectation that an electronic cutter will cut perfectly. I think that is one reason that I have quite the collection of circle punches! I love perfect circles. I hate it when my 12" cutters bow out sometimes during a cut.The big Fiskars with the wire in the center has eliminated some of my frustration with that cut imperfection. I think most of us have something that drives us nuts. If you are going to put time and money into creating something you want it to come out right. My pet peeve is paper that looks great until you try to find ribbon or other embellishments to go with it and suddenly the colors are not as true as you thought they were. Color is a huge thing to me... I really enjoy reading your posts. It was fun today to look back and remember, I've been following you a long time! The intricate (sp) is exactly why i got excited about the Cricut Explore...especially in a smaller size...i havent been able to get good cuts on fonts in a size smaller than an inch or an inch and a quarter...i am so excited ,..NO NO NO you are not crazy for want ing a good clean cut or precise sizing of holes...i want that too especially when i am making keepsakes !!!! Thanks so much for all you do for us and keeping us informed and listening to us, Makes a Difference!!! I did not realize the extent of your circle/scallop pet peeve! I am not sure if I have a crafting pet peeve. I have a couple of pet peeves around my house that are driving me nuts---my kids leaving their empty soda cans in spots where they should not be (I know--I should just stop buying soda!) and my husband always leaves the bathroom fan on, sometimes when he climbs into bed. He does not understand why I ask he to get out and turn it off! I don't know that I specifically get obsessed about something, but I do like things to be the way I want (or expect) them to be. I never really noticed the wonky cuts with the E2, but maybe I wasn't looking for them...makes me want to pull it out and try to see what I get! And, no I din't think you are crazy...everyone has their "thing" and that's just yours! I totally agree with you on the wonky circles and scallops. 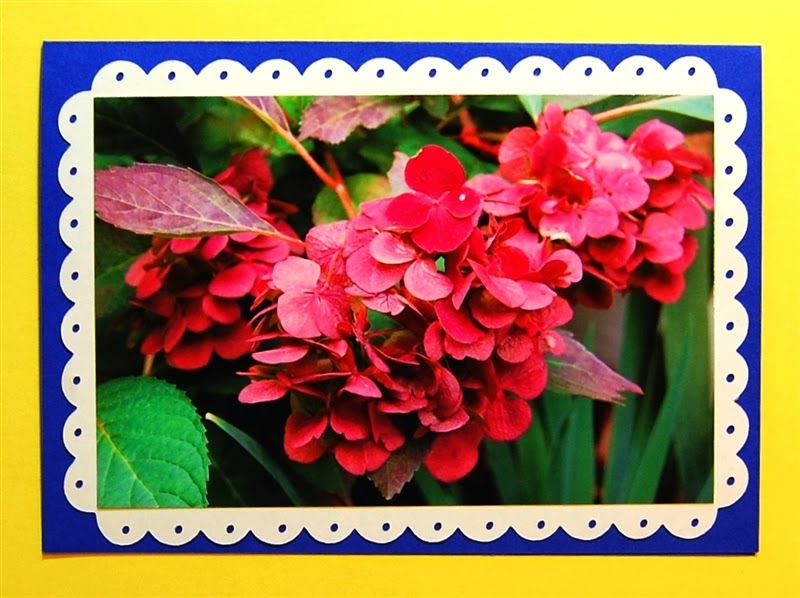 I love to use scallop shapes on my cards and it does make me crazy that they are always off kilter. I swore with all the Provo Craft/Cricut unkept promises and issues in the past that I would never buy another one of their machines, however this Explore has really pealed my interest. I already have 3 Cricut machines and a couple hundred cartridges plus a Cameo so I really don't need another machine. But like you it sure would be nice to cut out the designs on my cartridges correctly. I guess I will wait and see how everyone feels after they (and you)get their Explores and play with them a while. 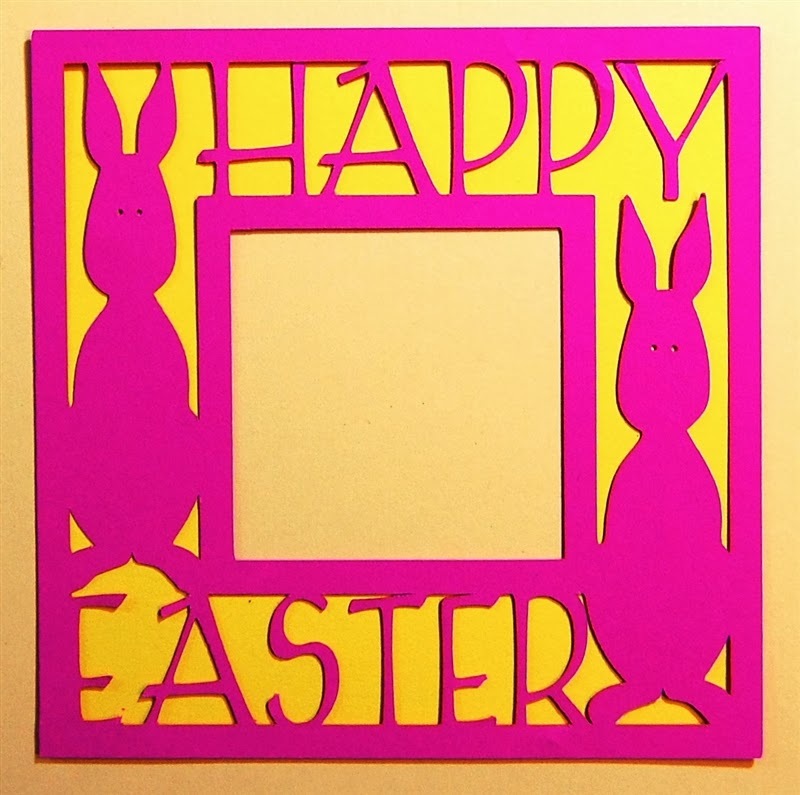 Crafting pet peeve: Never have had much luck cutting fine or intricate designs with my old original Cricut. Sounds like the Explore might solve that problem! Well, If you are crazy then what does that make us? HA! I am really interested in the Explore. I hate it when things don't look like they did on the mat. I use the Cricut Expressions. It seems to work well, but then occasionally it gets wonky as you say. I don't get too obsessed with perfection. After all it's crafting, something made by a person. Thank you for all of your instructions and inspiration! When using the Explore with the online program can you still use all the cartridges that you already own from Cricut? What is the price range for the Explore? Does it use the same USB cable? the circles and scallops are not a problem for me, the folks I craft for would never notice!!! however, I do appreciate improved technology and am looking forward to my Explore..can't wait to play! I think I've followed you since DS days..welding is a wonderful thing! No! you are not crazy, that drives me crazy also, I don't kn ow about the new machine, I'm not to thrilled having to hook it up to the computer, and lately doesn't seem like I have been using my Circut as much seems like using dies is much easier. I enjoy your blog and all the info that you provide and all your beautiful creations. I like everything to be even, my husband thinks I am the crazy one. Thanks for the info on the Explore. I am afraid that it is too technical for me. I have an Expression and many cartridges, but do not use them too their fullness. Love punches and the Big Shot. No, I don't think you're crazy about getting the right shapes when you cut something! I, too, like symmetry in my designs. My pet crafting peeve is when I've spent time cutting out an intricate design, and the paper rips. I agree . The circles and scallops problem does seem to be fixed on the cricut explore. I am hoping to order the explore machine from hsn. Unfortunately there is was a glitch in my internet and I was unable to order it at the launch. I am waiting anxiously for the return of the explore. Oh no your are not crazy! I too am frustrated with the wonky circle and scallop thing! However, I CAN NOT have a machine that is computer dependent. The Gypsy was as far as I go. My computer and where I have to craft are no where close to each other. I do not like to see buttons on a project that are not threaded. There is something about it that looks unfinished. I do not like seeing letter with the "innards" not removed...like the capital B or the lowercase e.
When a bow is placed on the card using the "Cheated method" and then the separate bow is glue dotted in place....when straight part of the ribbon is not "pinched" where the bow is placed...looks odd. when an image is fussy cut out (for example a person image) and the space between the legs is not cut out as well. My pet peeve is a bad an paper cutter , I probably have 7 different ones, from Creative Memories, fiskars, an several others, I don't remember there names....I like the "My buddy very much for crops an at home my too expensive cutterpillar pro. No I don't think you are obsessed with perfect holes, because I like perfect cuts!!! So appreciate your help with the paper crafting world. I have a love-hate relationship with adhesives. Need to look at your recommendations on which one to use in each situation, how not to get it where it shows, etc. thanks for your blog. You are not crazy. If you are, so am I. 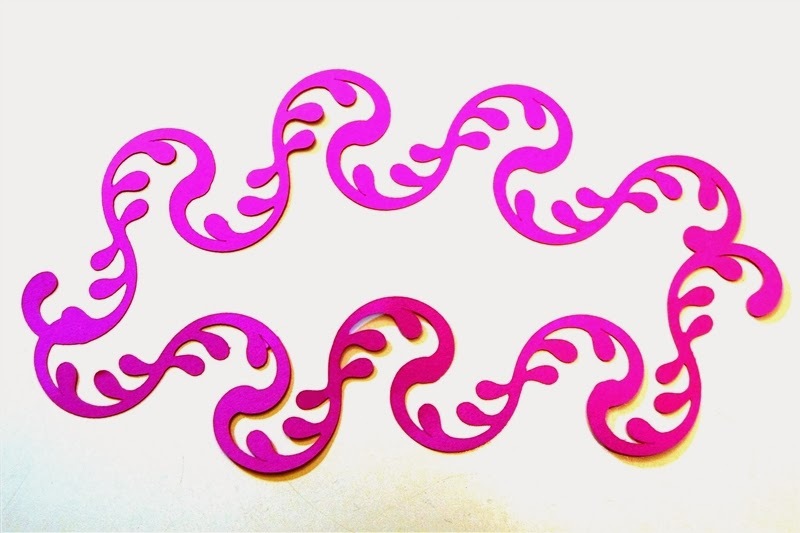 Would love to cut 'not wonky' scallops and circles on a Cricut. I'm looking forward to a review of the new machine after you get to work with it a bit. You are not alone, if it isn't perfect into the trash it goes. I was planning on buying.. but it sold out on HSN. Like you, I have to many cartridges and am looking forward to a more precise cut. I am obsessed with perfection. I too like symetrical images to be symetrical, especially if I am creating something that is double sided. Why call it a circle if it comes out like an oval? I don't think expecting a circle to be a perfect circle is too much to ask, so I too have been much bothered by the wonky circles and scallops-we are on the same wave link!!! I did not order the new Explore, I am waiting to see how those getting the machine will find that they love it and that PC makes the other promises happen. I'm happy that Cricut had finally figured out the scallop circle. I'm sad they did away with the keypad and is only internet required. I do most of my scrapping at rustic retreats where phone service is sketchy and internet is non existent. I would have hipped on the bandwagon immediately if I could have used a cartridge or gypsy offline. Thanks for the tips. This is helpful. I can relate to your feelings about the circles; I want things to be at least nearly perfect. I haven't noticed that problem with my Expression. I was tempted to purchase the Explore because of the dual pen/blade feature but decided to wait. I hope I don't regret that decision. Enjoy your new machine and your perfect circles. I'm not that fussy about the fine details on the Cricut cuts. I doubt if most people really look that hard at the cuts. It really bothers me when I don't get clean, sharp heat embossed images. 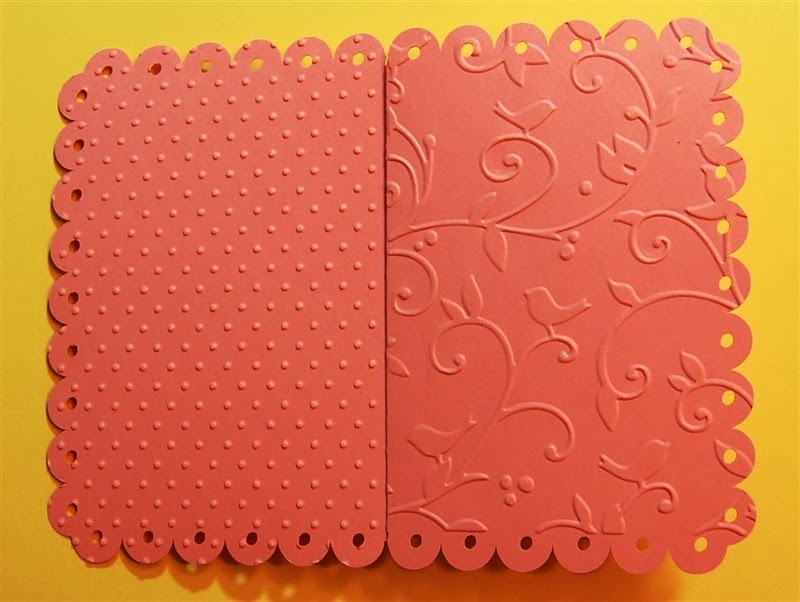 I always have some small dots or splotches of embossing powder where it doesn't belong. I've tried using fabric softener sheets to minimize static, a dust buddy to eliminate any extraneous dust particles, and tapping like crazy before heating the image. I rarely get a really clean, perfect image. I understand completely your obsession with a perfect image! My pet peeve is finding an adhesive to use with velum that doesn't show through. I'm waiting for comments from owners of the new machine to see whether or not I want to buy it. Like you, I like my cuts to be perfect. I think you are right to demand perfection from a machine cut. I can do wonky myself. I don't need a machine to do it for me! Glad that cricut finally got with the program. Love the question, we must all be a little crazy, but crafting is cheaper than therapy, right? And we're all in good company! I'm nutty about getting my layers perfectly even all around. Hate lopsided edges. 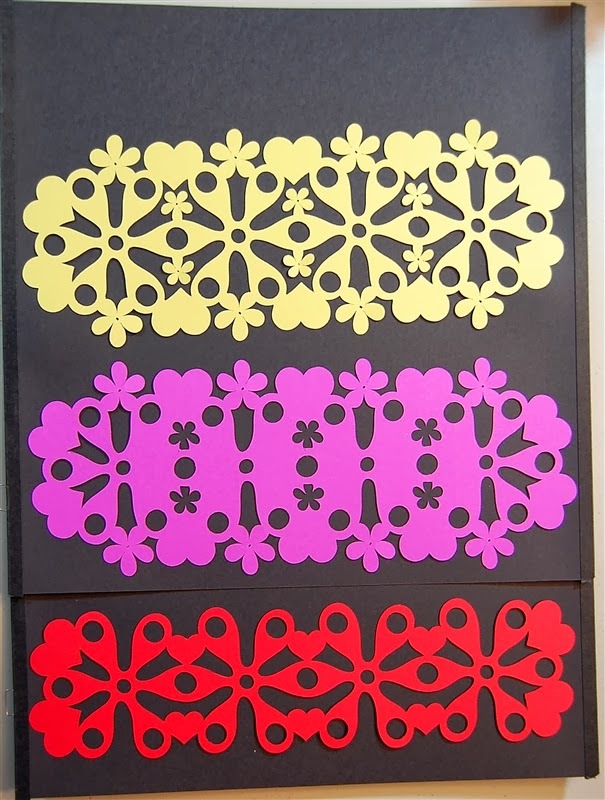 Love your comparing the Cricut cuts with Silhouette, big difference. Watched Joy's Explore video on YouTube, great job. I don't get my Explore until March, so will watch your blog with interest when you get yours. When I started watching HSN in California at 5:30 am, the first group of Explores were sold out, But at least it's coming in March,,,,Love following your blog. Crazy no obsessed maybe just a little. When the project is all put together no one but you looks at each piece. I learned that the hard way. 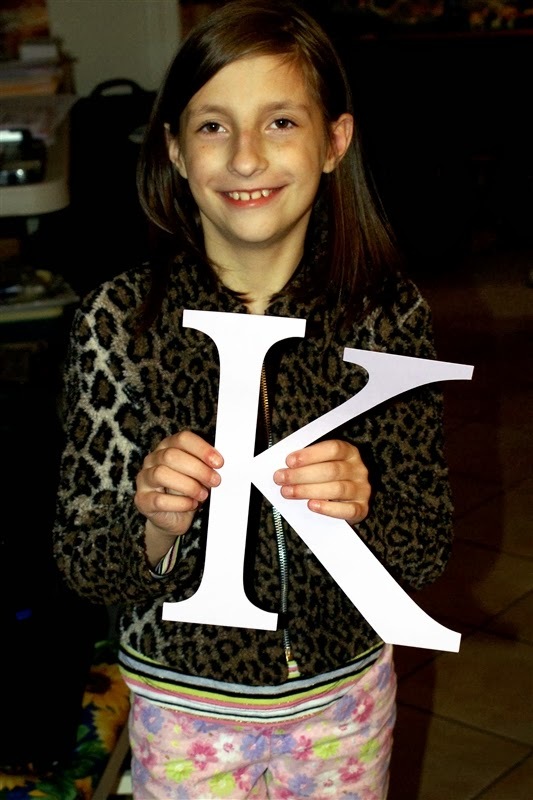 My pet peeve is letters. I want to use very small letters and sometimes I have to cut many times before I get a good one. I heard that you have to purchase a monthly contract to be able to cut with the new machine. I do love the fact that you can write with it. I know that you can use a pen with our old cricuts but they only outline the letters. Would love to have a cartridge that doesn't just outline the letters. When you make a project can you send us a cut file? If I don't have the same cart. I try and recreate with what I do have. Is the sun out today? I am obsessed with making sure a product works the way it should prior to being released to the public for purchase. I used to be a software tester for a Fortune 500 company and if we released anything with as many bugs in it (like some of the cricut products) we would have been put out of business long ago. So my crafting pet peeve is that if something is made available to buy, it better work as it should. This includes stickiness of bling, glue, machines, whatever. I wan't it to work for the long haul because I invest so much money into the craft. You are by no means crazy, you are passionate about your creations and have certain expectations. I think we all do it just depends on what it is. I don't think you're crazy and I appreciate the analysis! I'm a bit obsessed with matching paper colors and picking paper colors that work together! My pet peeve is: why doesn't anyone make tape for a taper roller that is really, really sticky and why does tape have to cost so much? I'm enjoying your blog! I still haven't learned how to match up the cut words when I am doing the shadowing ugh. Do you have a video to show me how to do the Happy Easter L O? I have problem with papers matching. I'm still learning how to use my E2. I like using the CCR with my carts and seeing what I want to do. I still like just using my carts and not having to design my LO or card. I Tend to overthink things when I scrap. I worry about papers matching, if my cuts are ok, and what else can I add without overdoing it. Thanks for all the reviews you have done in the past and I look forward to hear what you think of the Explore. How else can we decide if these products are really worth our money. I don't think I have just one pet peeve about scrapbooking, but over time I come across a few here and there. I guess my biggest one is more with myself because I'm such a slow scrapper and always trying to find ways to speed up my scrapping! I love the digital cutters, I have 2 but don't get a lot of time to work with them, but I can understand your dilemma with the not so perfect scallops!! Glad they finally got it right for you! I'm not so obsessed with specific shapes cutting correctly but it bugs me when I can't cut intricate designs at the small sizes I'd like to use. My current craft pet peeve is the latest scrap page design where all the photos and embellishments are piled into one tiny location leaving the rest of the 12x12 page blank - not even covered with a patterned paper. These people either don't take a lot of photos of have a spare house to store all their scrapbooks. It seems such a waste of space to me and so many people are doing it. Thanks for providing your opinion on the various machines. It's nice to have insight without the cash outlay. Your pet peeve is shared. I hate it when you buy something and it doesn't work as advertized. I have trouble cutting straight lines. I use the laser to get things on layouts straight.Also use perfect layers.I love your blog and reading it is informative.Thanks for all your work and sharing with us. I don't obsess about much. Imperfection is part of hand made, even if it's a machine helping. Calm down and craft on. Relax. I don't think I obsess about it but I do get totally frustrated when my cricut will not cut the image like it's supposed to. I have DS but don't really know how to create and using the images to make a unique image. I don't think you're crazy. It always drives me nuts when my cuts don't come out the waythey should! I never noticed the scallops were "wonky". :) I got the cricut in the first place for scrapbook titles so I always focused on the alphabets. Thank you for your comparisons between the different machines. I am not as good a crafter as you are so I had not noticed the difference until your post. I was shocked!! Your posts are really making me really take the time to consider this new machine. I look forward to more of your insights. Thank you! Thanks for the comparisons. That was great detailed information. My pet peeve is the differences with cutting boards. I guess that I should just stick to one but if the blade in one has gone dull and I'm out, I go to the other one that I have. It becomes obvious that the measurements are slightly off. That does annoy me. I'm pretty OCD, so "wonky" shapes do bother me! I also can't handle crooked items that were meant to be straight but aren't! The output of the design is definitely a must . I have a lot of items thrown in a pile that are not exactly perfect . I have seen a lot or reviews about the Cricut Explore and hopes I did the right thing in ordering one of the one for HSN. I am truly impressed by all it can do .. I only have the original expression and find it really time consuming to make the right cuts and find the pattern I am looking for through all the carts that I own. I love the new Cricut Design room . I am also excited to have all the layers line up and pull thru on separate mats for all my Disney carts. Looking forward to great things. Thanks for sharing all your great insights and tips on your blog !! Yeah, I got tired of using others' designs and wanted my own so I got the third-party software to use with my Cricut Expression. So much easier and cheaper! I agree that the inaccuracies are annoying. I've been irritated with print and cut problems. Having to resort to the "hinge method" keeps me looking around at other machines (currently use the E w/ 3rd party and Design Studio; I have no idea how to use my machine without the computer). 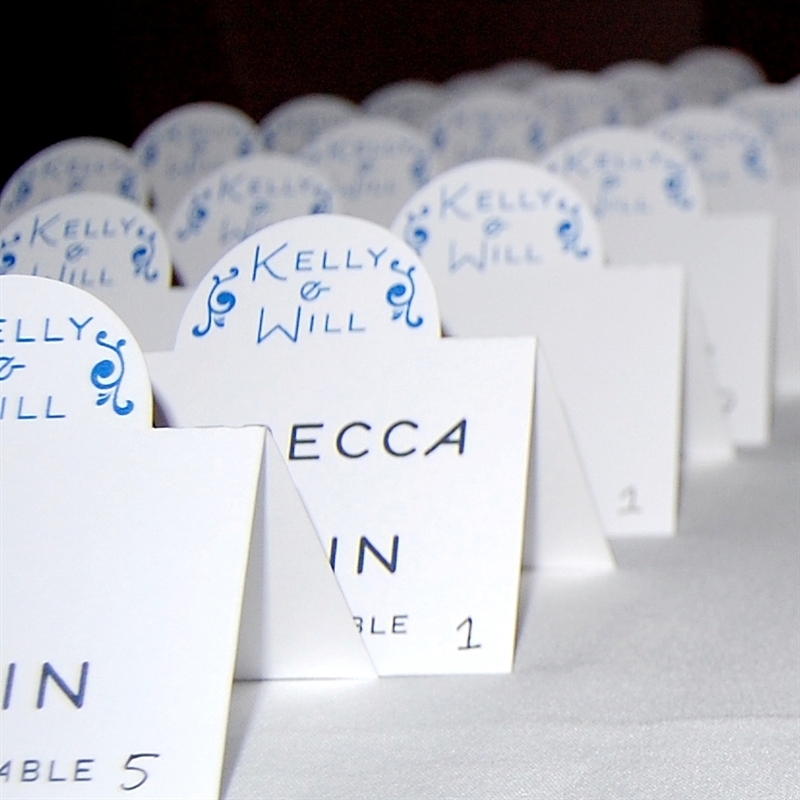 I have a thing for symmetry that sometimes drives me nuts; specially my photo mats. They need to be perfect. Lately I'm more "relax" and tell myself that art is handmade so it doesn't have to be perfect. Looking forward for your comparison between the Explore and the Cameo. Nope...not crazy! Accuracy with shapes is very important to me also and the reason I purchased the Cameo. That would have to be my "pet peeve"... Accuracy and consistency! I don't think you are crazy regarding the symmetry because I'm exactly the same way! You should get what you see when you design it. My pet peeve regarding crafting is Cricut releasing machines with the promise of "greatness" and then not delivering...can you tell I'm stuck with a $499 Cricut Imagine Paper Weight??? I'm hanging back on the Explorer, because it is filled with 'future' promises too so I think I will wIt to see if those promises are actually delivered. 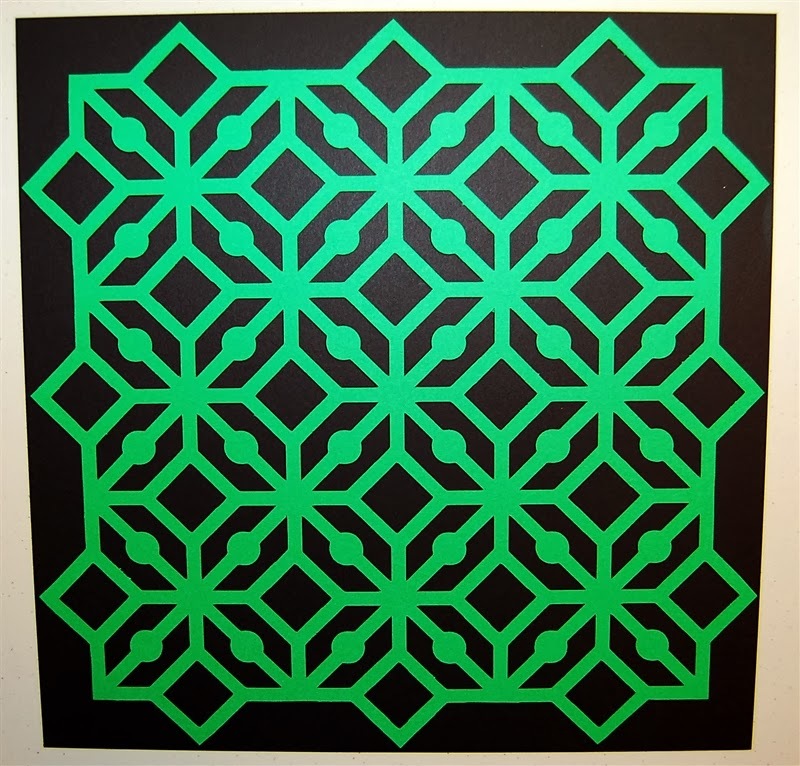 I can't really think of anything that drives me too nuts now but when I used to use my Cricut it would drive me crazy when my layers would not layer up right without me having to adjust it or just allow the rounded areas not to line up the same roundness. I love my Cameo ! I tend to be a perfectionist and stress too much on getting things 'just right'. I've been trying to let go of that ... with moderate success. A couple of things that make me crazy are rounded corners that aren't quite round (I've yet to find a punch that works the way I think it should), and card bases that don't line up perfectly when folded. That little 1/16 of an inch hanging over the edge will make me start all over!! Can't stand the wonky circles and cards that don't match up when folded. If other companies can do it, why not PC? But - right now my biggest gripe is the fact that PC keeps inventing new things that won't accommodate their older products. I ordered the Explore (against my better judgment) and then had to cancel it. You can only use your carts if they are linked to Design Space. I have over 250 carts and over 200 are linked to my Gypsy. My G will not link with CCR. Can't use CCR anymore. (stopped working with my E2 months ago) Since I do not want to pay $300 for a machine I can't use my carts on, I cancelled. So I feel a little left out of what looks like a great new machine. Wow.I need to read these comments. Some of them are interesting. One of my pet peeves is the image not cutting like it shows in the handbook. I get tired of trying to trim out the cut where it starts and stops and is "wonky". Uneven circles and scallops bug me too. I have also ordered the new machine and hope it fixes these problems. Have had the same frustrations. Thanks for the research and further postings. Yes... I love my corner punch and I am a paper hoarder. Thanks for all the things that you help the bloggers with. I have been following your blog; Joy's and Melanie's for some time. I too am obsessed with the wonky circles and scalloped circles. It bugs me everytime I cut them. Sometimes I try to adjust them with scissors, which is always a total fail. I too have been watching news of the new Explore to see what things this new machine will correct in my list of things that bother me with my current Expressions. Thank you so much for this post and I will continue to follow and consider all of the good information provided. I totally agree with your wonky scallop problem, esp. with the circles in them. I also hate when I punch a border and can't get it to center right on a card. I believe you've covered that problem before too ;- ) You are always a great help with getting those tiny details right. Thanks for all your help, Diane! I guess my pet peeve with the cricut is the intricate images not cutting properly! I am very interested in the new Explore but don't know yet if its worth it! I have the baby bug the expression the imagine and cameo! Do I really need the Explore? I will have to learn more about it! Wonky cuts drive me crazy. I bought the baby bug and Expression, but also used SCAL so I could make my own designs and cut SVGs. I jumped ship when the Cameo came out and haven't looked back. I LOVE it... No broken promises, no wonky cuts, and detail down to tiny sizes. Not to mention they listened to what consumers wanted and delivered. Cricut owes their prior customers the updates, functionality, and fixes for their existing machines they promised when they sold them. Its fine if folks want to buy the new machine for the new functionality, but its not cool that someone would need to do it to get their existing cartridges to cut accurately. Guess my craft obsession is getting the full value of my $ for craft supplies and tools. ;-) Sorry for the rant! No you definitely are not crazy I get uptight about those little things as well. Don't tell me it will do something if it won't I purchased the Ecraft by craftwell and let me tell you it does need a mat or you can't cut with it I see they have finally taken it off of the market. I find all this analysis very interesting and shall be interested in your further findings. Having branched out into the Silhouette do you have any opinions or information on the new Brother Scan and Cut? that I never have enough time to do what I want. I always run out of steam. Well, I THOUGHT I didn't have pet peeves until I read all the comments! I guess my brain is asleep! I HAVE been frustrated by "wonky" cut, but I usually just embellish them so that the recipient can't tell! I am really excited about the new machine! I placed my order on HSN and am now anxiously waiting for my new toy to arrive! Thank you for your thoughts on it! I used to spend so much time trying to match colors, paper, brads, ribbon, etc. that I would not get anything done. Now I order my paper, etc. through my CTMH consultant and everything matches. Wonky cuts do bother me. Especially all the ones the cricut cut! That's why I sold most of my cartridges to earn enough money to buy my Cameo. Now I'm smiling all the time! No, you are not crazy about your obsession. I got really frustrated one day while cutting scallops and to this day just thought it was my machine. Glad you clarified that for me, only 2 years too late, lol. I am obsessed with sorting, I spend too much time organizing and reorganizing and then can't find anything. I like everything to be very symmetrical and it drives me crazy when things don't match up correctly. I am in complete agreement with you...the shapes should look like they are supposed to and like they are pictured in the books. You are not crazy (or maybe we all are...LOL). You are definitely not crazy! My thing is neat & clean lines. Every now & again, I will do something with ripped edges or some other type of random design, but I, too love symmetry and smoothness in my designs. I think that may be why I have finally decided to create a scrapbook since I came across the card-based scrapbooking systems! I don't know of any really pet peeves, but I do tend to lean more to the clean and simple look. Let the Celebration Begin - 6th Blogoversary!